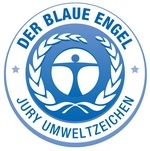 At the intitiative of the German Ministry of the Environment, new particle emission tests have been added to the criteria for the Blue Angel certification process for printers and multifunctions. This decision has been fairly widely supported by the laser hard-copy output manufacturers through the BITKOM group. The test which has been added to the list of tests which a machine must pass to get the Blue Angel label is intended to help buyers and consumers identify machines with reduced particulate emissions. For a printer or a multifunction, the Commission has set the bar at 3,05 x 1011 particles over 10 minutes printing. For the moment, this new test is only being applied for small printing devices. It has been added to the hundred or so other tests that a printer or copier must pass to get the Blue Angel certificate. Since January 1, 2013 all Blue Angel certification requests for office printing equipment are measured against the criteria set out in RAL-UZ 171. The older standard, RAL-UZ 122 is no longer valid. January 1, 2014 marked the end of the transitional period during which both versions of the Blue Angel certificate were valid. The DataMaster Online machines database has been updated to account of the changes. As a result, some machines have lost their Blue Angel accreditation, notably those which came out before January 1, 2013.